File photo from 2016 of J.J. Channell (left) of Bangor takes two scoops of cake batter and a dish of deer tracks from Gifford's senior shift leader Tori Dyer on the first day of ice cream season. "It's been very busy, despite the snow," Dyer said. Bangor roadways have been plagued with a high number of potholes this season. 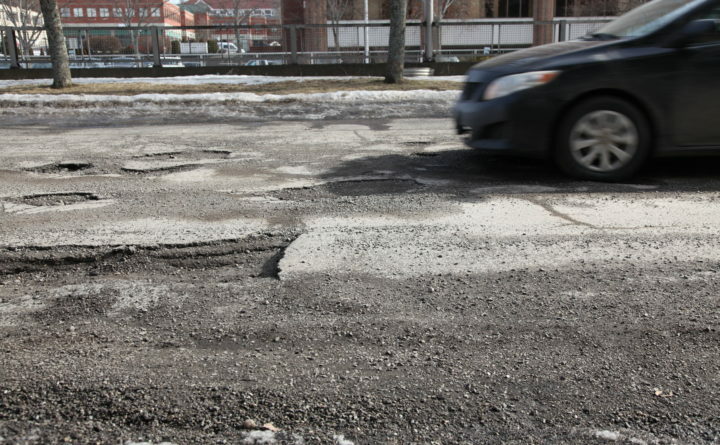 A combination of road salt, which stalls the freezing process, and spring-like conditions, which melts the ice, has led to a softening of roadways, which leads to cracks in asphalt. Yes, folks, it’s true: It’s the first day of spring. We are very much aware of the fact that in Greater Bangor it won’t get much above freezing today, but nevertheless the Earth keeps moving closer to longer days and warmer weather. What are some of the signs of spring in Greater Bangor? Read on. The obvious signs of spring are natural phenomena, such as robins, cardinals, crocuses, flowing water in streams, a bud or two on a branch here and there. Squirrels, waterfowl and (unfortunately for curious dogs) skunks are out sniffing around for food and for mates. Sap in maple trees has already started to flow. Signs of spring are everywhere, even if the temperature is still freezing. Let’s face it: Driving in Maine during March is not too different from what we imagine it would be like driving on Mars. Some roads are so rife with potholes they are barely passable. A lot of the worst ones will get filled in the next few weeks, but expect bad driving conditions at least until the end of April. And maybe set aside a few bucks for an alignment adjustment for your car. There are people who ask why anyone would eat ice cream during the winter, when it’s cold out. And then there are those people who think the above-mentioned people are fools. Ice cream is good any time of year, and the folks at Gifford’s in Bangor and Jimmy’s in Brewer know it. That’s why they open just before or right on the first day of spring, regardless of the actual temperature outside. 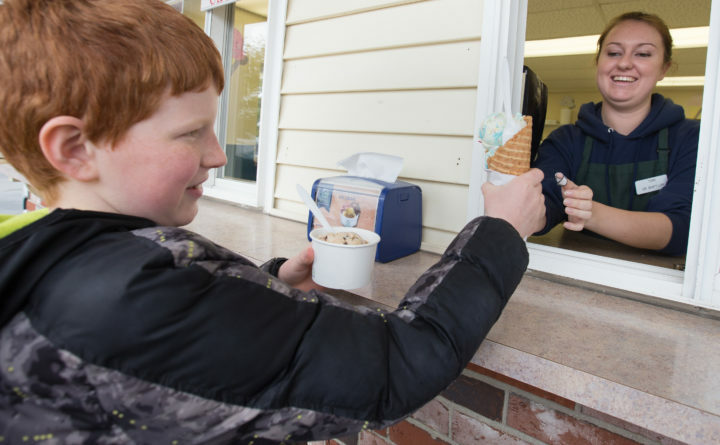 Jimmy’s started offering tasty soft-serve at its takeout stand on North Main Street in Brewer a couple of weeks ago, actually, and Gifford’s on Broadway has opened on the first day of spring for years and years now. This one doesn’t usually happen until slightly later in the month — even as late as early April — but inevitably, on the first 50-plus degree day, the first shirtless guy will be spotted. This gentleman, so overjoyed by the relative balminess of the air, can think of no better way to express his delight at the warmth of the day than by shedding his pesky clothes and walking around downtown Bangor au natural from the waist up. You have no choice but to accept his body positivity. After many months of being covered, the snow starts to recede, revealing hidden treasures long buried under a convenient blanket of snow. Aside from the typical bits of carelessly tossed litter like coffee cups, soda bottles, empty packs of cigarettes and “nip” bottles, there’s, of course, little dog-made landmines to contend with. We wonder, do people realize littering is just as bad in the winter as it is in the summer, when your laziness can’t be hidden by snow? In December, shoveling, blowing, sanding and salting your walkway or driveway was a labor of love, done with military precision and attention to detail. Nice, crisp edges. Not a slippery patch in sight. Every inch of snow carefully scraped off the car. Beautiful, really. In March, it’s a different story. It’s a cursory effort, done solely to get you and your family out of the house. Sure, one foot is enough space to walk in. Your entire truck bed is full of crusty snow. The snowbank at the end of the drive is so tall that even White Walkers can’t get over it. Out of salt? No problem; this container of Morton’s will do just fine. It’s all gonna melt next week anyway. Right?